Comcast’s X1 platform is indeed getting back into the game. The cable operator has teamed with London-based TransGaming to offer more than a dozen casual gaming titles on compatible X1 set-top boxes. The new service, coming way of TransGaming’s GameTreeTV offering, began to appear on the X1 apps section late last week. Early on, X1 has teed up more than a dozen games, including Tomb Runner, Text Twist, Solitaire, Yeti Getaway, Doodle Jump, World Poker Tour, Mahjong, Tetris, and Darts, among others. All of those games are played and controlled with the X1 remote. Comcast’s new free gaming offering is delivered to X1 boxes via the internet, so it will be subject to the operator’s usage-based broadband data policies. Comcast has also integrated a batch of other OTT services, including Netflix, YouTube, Pandora and iHeartRadio, with its X1 platform. The launch also marks a return of sorts by Comcast into gaming on the set-top box. Comcast, which had tested (and later shut down) a console-style gaming service with EA on X1 boxes, is also using those devices to offer and sell an episodic, interactive game called The Walking Dead in partnership with Telltale Games. Earlier this month, Comcast noted that it’s currently in the exploration phase with respect to offering casual, interactive games on X1. Consider the deployment with TransGaming to be an extension on that exploration. In Comcast, TransGaming, a major MVPD to its list of partners. TransGaming, which has been offering games and game services with MVPD partners for more than a decade confirmed that also works with Dish Network (for its Hopper Arcade service) and is live in nine countries with Liberty Global. It also works with France’s Freebox Revolution, and offers games on Roku devices as well as connected TVs from Samsung, Vizio and Philips. TransGaming’s GameTreeTV service currently has a library of more than 100 games, and a “very big focus on HTML5,” an official noted. 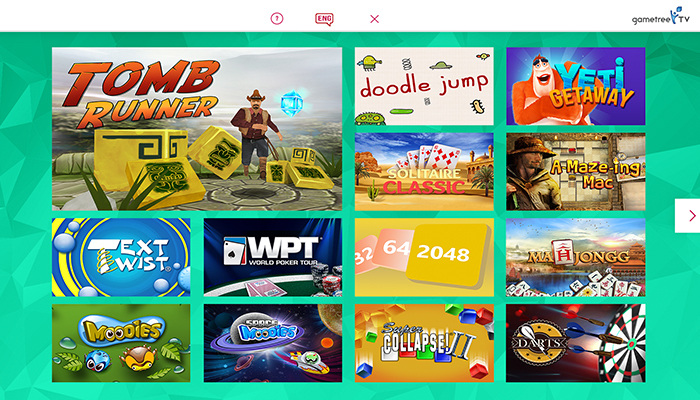 TransGaming’s business model is based on advertising and in-app purchases, as well as subscriptions and licensing deals.